The AQA GCSE Science specification calls for students to understand and apply the concepts of not only thermal energy stores but also internal energy. What follows is my understanding of the distinction between the two, which I hope will be of use to all science teachers. My own understanding of this topic has undergone some changes thanks to some fascinating (and ongoing) discussions via EduTwitter. a microscopic lens, where we focus on using the particle model to explain phase changes such as melting and freezing. In many ways, they are an excellent representation. 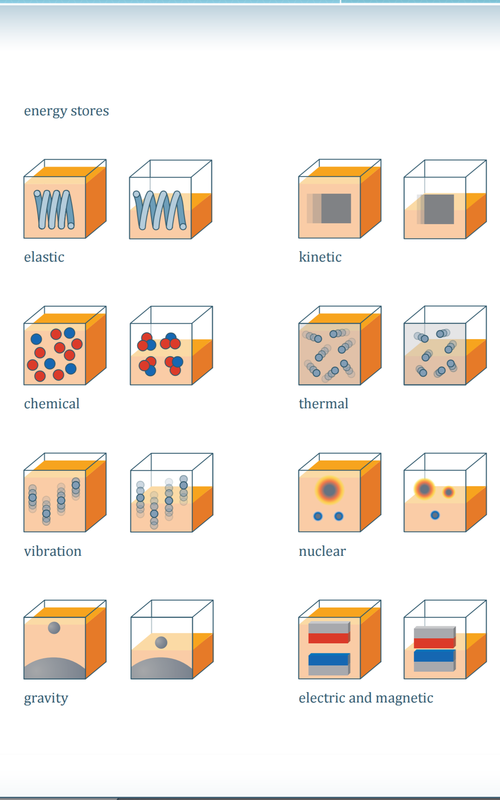 Firstly, energy is represented as a “quasi-material entity” in the form of an orange liquid which can be shifted between stores, so the enoji on the left could represent an aluminium block before it is heated, and the one on the right after it is heated. Secondly, it also attempts to make clear that the so-called forms of energy are labels added for human convenience and that energy is the same basic “stuff” whether it is in the thermal energy store or the kinetic energy store. Thirdly, it makes the link between kinetic theory and thermal energy stores explicit: the particles in a hot object are moving faster than the particles in the colder object. However, I think the third point is not necessarily an advantage as I believe it will muddy the conceptual waters when it comes to talking about internal energy later on. In other words, a change in the thermal energy store is always associated with a temperature change. To increase the temperature of an object, we need to shift energy into the thermal energy store. To cool an object, energy needs to be shifted out of the thermal energy store. This has the advantage of focusing on the directly observable macroscopic properties of the system and is, I think, broadly in line with the approach suggested by the AQA specification. Internal energy is the “hidden” energy of an object. The “visible” energies associated with an object would include its kinetic energy store if it is moving, and its gravitational potential energy store if it is lifted above ground level. But there is also a deeper, macroscopically-invisible store of energy associated with the particles of which the object is composed. To understand internal energy, we have to look through our microscopic lens. The total of the kinetic energies of the atoms and molecules of which a system consists and the potential energies associated with their mutual interactions. It does not include the kinetic and potential energies of the system as a whole nor their nuclear energies or other intra-atomic energies. We can never measure or calculate the value of the absolute internal energy of a system in a particular state since energy will be shifting from kinetic energy stores to potential energy stores and vice versa moment-by-moment. What is a useful and significant quantity is the change in the internal energy, particularly when we are considering phase changes such as solid to liquid and so on. This means that internal energy is not synonymous with thermal energy; rather, the thermal energy of a system can be taken as being a part (but not the whole) of the internal energy of the system. As Rod Nave (2000) points out in his excellent web resource Hyperphysics, what we think of as the thermal energy store of a system (i.e. the sum of the translational kinetic energies of small point-like particles), is often an extremely small part of the total internal energy of the system. My excellent Edu-tweeting colleague @PhysicsUK has pointed out that there is indeed a discrepancy between the equations presented by AQA in their specification and on the student equation sheet. If a change in thermal energy is always associated with a change in temperature (macroscopic lens) then we should not use the term to describe the energy change associated with a change of state when there is no temperature change (microscopic lens). @PhysicsUK reports that AQA have ‘fessed up to the mistake and intend to correct it in the near future. Sooner would be better than later, please, AQA! Nave, R. (2000). HyperPhysics. Georgia State University, Department of Physics and Astronomy. Why do we make these analogies? It is not just to co-opt words but to co-opt their inferential machinery. Some deductions that apply to motion and space also apply nicely to possession, circumstances and time. That allows the deductive machinery for space to be borrowed for reasoning about other subjects. […] The mind couches abstract concepts in concrete terms. I am, I must confess, a great believer in the power of analogy. Although an analogy is, in the end, only an analogy and must not be confused with the thing itself, it can be helpful. As Steven Pinker notes above, the great thing about concrete analogies and models of abstract concepts is that they allow us to co-opt the inferential machinery of well-understood, concrete concepts and apply them to abstract phenomena: for example, we often treat time as if it were space (“We’re moving into spring”, “Christmas will soon be here”, and so on). To that end, I propose introducing the energy stores and pathways of the IoP model to KS3 and GCSE students as tanks and taps. Consider the winding up of an elastic band. One advantage I think this has over one of my previous efforts is that I am not inventing new objects with arbitrary properties; rather, I am using familiar objects in the hope of co-opting their inferential machinery. Suggestions, comments and criticisms are always welcome. He must surmount these propositions; then he sees the world rightly. IoP Energy: It’s About The Physics, Stupid! OK, so I was wrong. In a previous blog, I suggested a possible “diagrammatic” way of teaching energy at GCSE which I thought was in line with the new IoP approach. Thanks to a number of frank (but always cordial!) discussions with a number of people — and after a fair bit of denial on my part — I have reluctantly reached the conclusion that I was barking up the wrong diagrammatic tree. The problem, I think, is that unconsciously I was too caught up in the old ways of thinking about energy. I saw implementing the new IoP approach as being primarily about merely transferring (if you’ll pardon the pun) the vocabulary. “Kinetic store” instead of “kinetic energy”? Check. “Gravity store” instead of “gravitational potential energy”? Check. “Radiation-pathway-thingy” instead of “light energy”? Check. Let’s look at the common example of a light bulb and I will try to explain. In spite of its comforting familiarity, however, there are problems with this: in what way does it advance our scientific understanding beyond the bare statement “electricity supplied to the bulb produces light and heat”. Does adding the word “energy” make it more scientific? For example, when we are considering “light energy”, are we talking about the energy radiated as visible light or the total energy emitted as electromagnetic waves? It is unclear. When we are considering “heat energy” are we talking about the energy emitted as infrared rays or the increase in the internal energy of the bulb and its immediate surroundings? Again, it is unclear. In the end, explanations of this stripe are all-too-similar to that of Moliere’s doctors in The Imaginary Invalid, who explained that the sleep-inducing properties of opium were due to its “dormative virtues”; that is to say, sleep was induced by its sleep-inducing properties. The problem with the energy transfer paradigm is that it draws a veil over the natural world, but it is a veil that obscures rather than simplifies. The IoP, after much debate, collectively rolled up its sleeves and decided that it was time to take out the trash. In other words, they wanted to remove the encumbrance of terms that had, over time, essentially become unintelligible. The new IoP model distinguishes between stores and pathways. For example, an object lifted above ground level is a gravity store because the energy is potentially available to do work. Pathways, on the other hand, are a means of transferring energy rather than storing energy. For example, the light emitted by a bulb is not available to do work in the same sense as the energy of a lifted weight. It is, within the limits of the room containing the bulb, a transient phenomenon. Many photons will be absorbed by the surfaces within the room; a small proportion of photons will escape through the window and embark on a journey to Proxima Centauri or beyond, perhaps. The stores are “leak-proof buckets” holding the “orange liquid” that represents energy. The pathways are “leaky containers” that enable energy to be transferred from one store to another. I have to admit, I was quite taken with the idea. The first criticism that gave me pause for thought was the question: why mention the thermal store of the bulb? Surely that’s a transient phenomenon that does not add to our understanding of the situation. Switch off the electric current and how long would the thermal store be significant? Wouldn’t it be better to limit the discussion to two snapshots at the beginning (electrical pathway in) and end (radiative pathway out)? The second question was: what does the orange liquid in the pathways represent? In my mind, I thought that the level might represent the rate of transfer of energy. Perhaps a high power transfer could be represented by a nearly full pathway, a low power transfer by a lower level. But this led to what I thought was the most devastating criticism: why invent objects and assign clever (but essentially arbitrary) rules about the way they interact when you could be talking about real Physics instead? Is there any extra information in the phrase “light energy” as opposed to simply the word “light”? Efficiency of a bulb: find the total energy emitted as visible light and divide by the total energy emitted as light of all wavelengths. And that’s when I realised that I wasn’t helping to take out the trash; in fact, I was leaving the rubbish in place and merely spray painting it orange. Now don’t get me wrong, I think there’s still a long road ahead of us before we become as comfortable with the IoP Energy newspeak as we were with the old paradigm. As a first step, I suggest all those interested should read and contribute to Alex Weatherall’s excellent Google doc summary to be found here. But I honestly believe that it’s a journey worth taking. IoP Energy: Notes Towards A Diagrammatic Teaching Approach? After a fascinating discussion led by the excellent Alex Weatherall (click here to participate in his Google doc Physics-fest — and follow @A_Weatherall on Twitter for more), I was thinking on possible teaching approaches for energy. Although I think the IoP‘s (the UK’s Institute of Physics) approach is conceptually sound (see previous post here) and addresses many of the shortcomings in the traditional and time-hallowed “forms of energy” approach, many Physics teachers (myself included) are struggling to find direct and simple ways of communicating the highly nuanced content to students. A (filament) light bulb is a device that takes energy in (input) through an electrical pathway (the current) to the thermal energy store of the filament (the metal is getting hotter) which transfers the energy through the radiation pathways of light (visible and IR). There is an increase in the thermal store of the room due to transfer via the heating pathway. The less energy transferred by heating compared to visible light the more efficient the light bulb. I think this is in accordance with the letter and spirit of the “IoP Energy Newspeak” approach; but sadly, I can picture many students struggling to understand this, even though it was written by many hands (including mine) with the best of intentions. Because it is an energy store, the amount of energy (represented by the level of orange liquid) in the store remains constant. Energy will not spontaneously leave the store. Energy stores don’t have holes. The unit we use with energy stores is the joule. However, energy pathways do have holes. In contrast to an energy store, the energy level in a pathway will spontaneously decrease as the energy is shifted to another store. To keep the energy level constant in a pathway, it needs to be constantly “topped up” by the energy from an energy store. Since a pathway represents a “flow” of energy, the unit we use with an energy pathway is the watt (one joule per second). The “orange liquid level” in the pathway icon could therefore represent the amount of energy flowing through in one second (although I concede that this idea, though promising, needs more thought). An energy store does not have any holes — unless it is linked to a pathway, like the gravity store above. Energy will move in the direction indicated by the energy pathway icon. The small upward and downward arrows are an attempt to indicate what happens to the energy level over time. Please note this is a work in progress. I fully expect many teachers will think that the suggested set of conventions may well prove more confusing for students. However, what I am attempting to do is to give students a set of simple, coherent yet serviceable analogies. In other words, this might provide a conceptual “tool kit” of physical representations of very abstract processes involving energy. I hope readers will agree that it offers some scope for further development. Comments, criticisms and suggestions would be most welcome. IoP Energy: “Store” of Wisdom or Little Shop of Horrors? This attention-grabbing definition of energy seems to lead naturally to a more formal definition of “Energy is the capacity to do work“. This still leaves the problem of defining work, of course, but as R. A. Lafferty once said, that’s another and much more unpleasant story. Chemical energy in the battery is transformed into electrical energy which is carried by the wires to the motor. The motor then transforms this into kinetic energy as the buggy moves. The battery supplies an electric current which makes the motor turn. This then makes the buggy move. The new approach to the teaching of energy developed by the Institute of Physics (IoP) suggests that we limit our consideration of energy to situations where we might want to do calculations (at KS4, KS5 or beyond). We should talk of energy being stored and shifted. The emphasis should be on the start and end of the process with minimal attention being given to any intermediate stages. lifting an object. Chemical potential energy store is emptied, and gravitational potential energy store is filled (note that we are not interested in intermediate motion as it doesn’t affect the final energy store). rolling an object down a slope to the bottom. Gravitational potential energy store is emptied and thermal energy stores (of slope, of pen) increased. Boiling water in kettle. Chemical store (from coal/gas power station) is emptied. Thermal store of water increased, thermal store of air increased, thermal store of kettle increased. The new approach has been adopted by all UK exam boards for their new specs and is used in the AQA approved textbooks. One major difference is that electric current and light are no longer considered as forms of energy. Rather, these are now regarded as means of transferring energy. I suggest these energy icons should be called enojis (by analogy with emojis). Probably the biggest adjustment for most teachers will be to avoid referring to light and sound as forms of energy and to treat them as pathways for transferring energy instead. More (much more!) on the IoP’s “energy as an orange liquid” model can be found at http://www.supportingphysicsteaching.net/En02TL.html and http://www.supportingphysicsteaching.net/En02PN.html. A PC approach to energy? Neil Atkin recently wrote a fascinating post about the “New” approach for teaching the concept of energy to secondary school students, and provides some interesting commentary and some very useful links: go read! I first came across the work of Ogborn and Boohan, on which much of the “New Approach” is based, in the 1990s. I remember embracing it enthusiastically. However, I subsequently returned to the more “traditional” kinetic-chemical-heat-potential-light-sound “naming of parts” model, mostly because many of the resources favoured by our students followed the older convention. 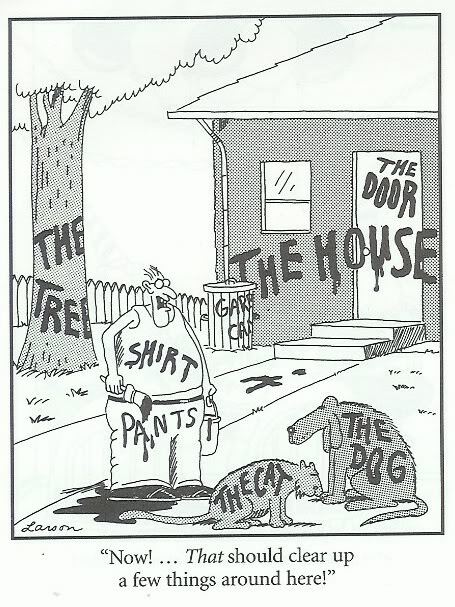 And so it has remained for a number of years, so I was all set to give the “New Approach” a proper rubbishing (as might be gleaned from my selection of the Gary Larson cartoon above) as a specious form of PC — physical correctness as opposed to political correctness, perhaps. [I]f we are to understand how to communicate a particular bit of knowledge . . . we must understand the essential features of the particular concept that we are attempting to convey. Only if we understand what it is and how it differs from related concepts can we design a communication that effectively conveys the concept to the learner. In other words, I think the “New Approach” is a more accurate representation of the physics of energy, and less likely to lead to misconceptions and false inferences. Read Dr Dav’s excellent blog post from 2013 for a clear summary of the arguments in favour of the New Approach, as well as Robin Millar’s excellent paper on the topic. One of the suggestions made in the IOP’s Energy 11-14 is to use ideograms or icons to represent different energy stores.